The logo of MAD About Coco leaves a deep impression to us. Afro hairstyle, Tiffany-blue frame sunglasses and bowtie in pink sum up to a cute, adorable head that draws curiosity to many once opened, asking what the cafe has to offer. 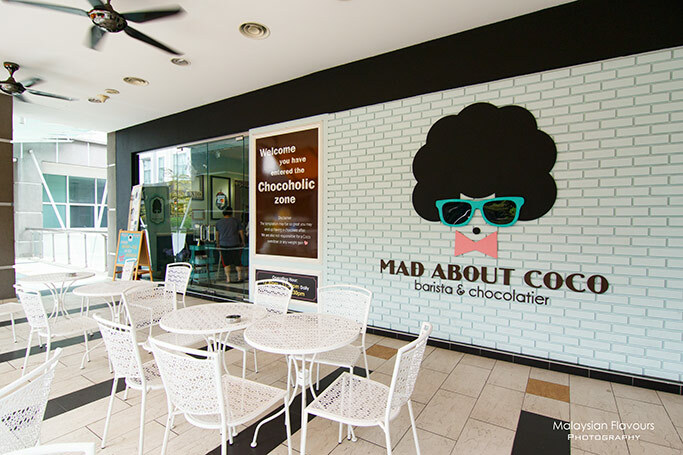 MAD About Coco sweeps across the town swiftly, getting attention not only for its attractive logo, but also the cafe’s signature delights- an extensive choices of tempting chocolate-loaded desserts that will get your hair “explodes” as in the logo! Yes, chocolate takes the limelight in MAD About Coco. 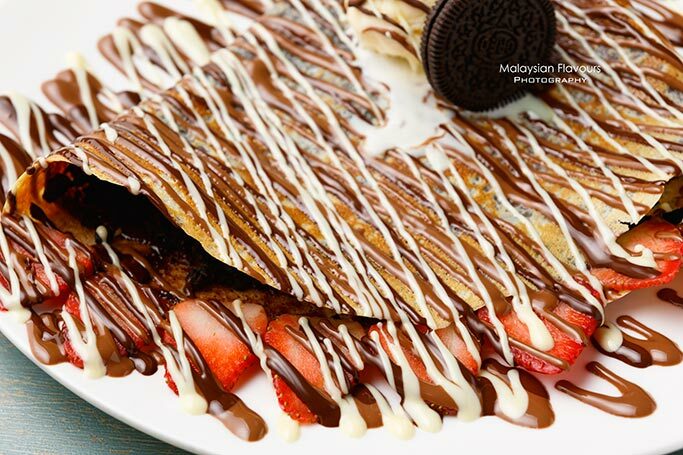 You can have it on pancake, crepe, cronuts, waffle, toast, etc.. Good thing is they are not skimp on the chocolate. Definitely a heaven for sweet treat lovers. A place that you should forget the guilt of over-calories. Just indulge heartily and think about workout later. 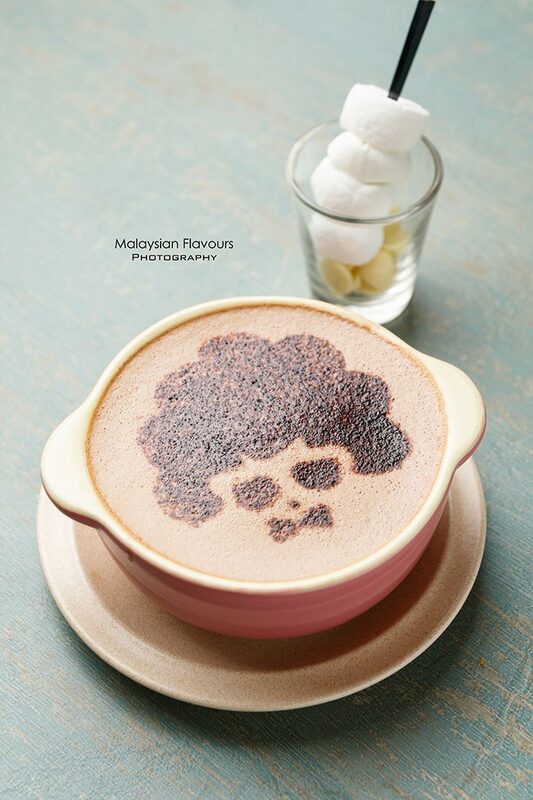 MAD About Coco has been operating in Publika Solaris Dutamas for more than one year. 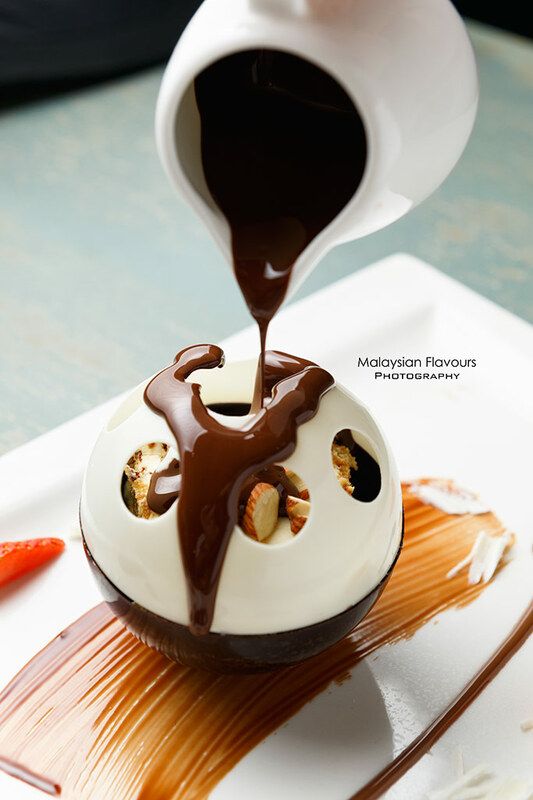 Congrates as they have expanded another outlet in Fahrenheit 88 Kuala Lumpur recently. 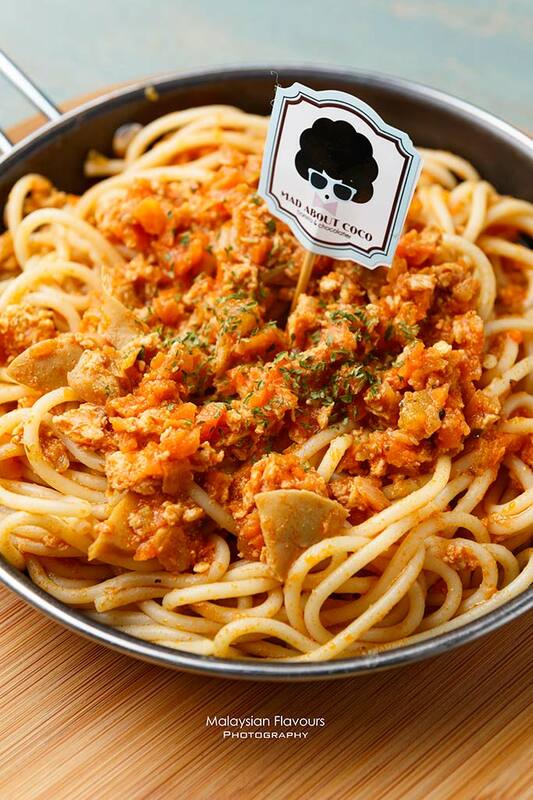 In Publika, MAD About Coco is located above Mee Java, same row with Yamagoya Ramen; For Fahrenheit 88 outlets, it is right above Body Shop, facing the main road. 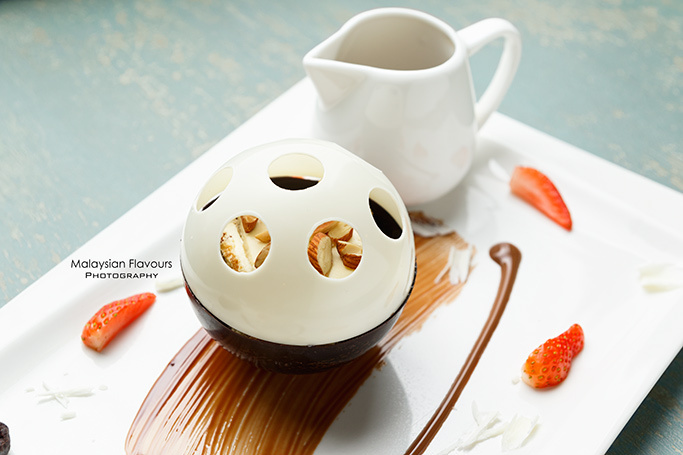 Best seller in MAD about Coco besides the signature MAD about Coco Chocolate Moist Cake, also one of the most inviting desserts to indulge in. Appears in hollow ball-shape made up of half white chocolate and half dark chocolate, encasing a small slice of tiramisu within, this dessert delivers contrasting crispy and spongy soft texture if eaten directly. MAD about Coco makes it more fun with a serving of pure chocolate sauce. Pour the pipping hot sauce over to deconstruct the entire crust, melting everything together to level up the rich, chocolaty goodness. 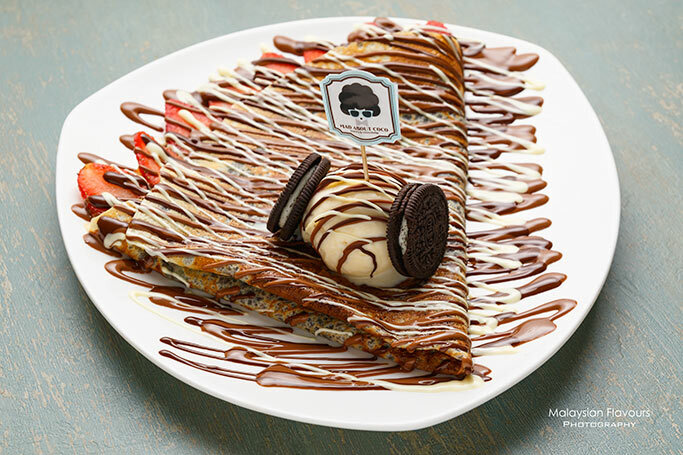 Crepe is of crispy base, enveloping a layer of sandy crushed oreo biscuit and further drizzled with chocolate sauce, finally crowned with a scoop of vanilla ice cream. Laced with thinly sliced strawberry for a tangy twist. Available also in banana and peanut butter; brownie; and cookies filled. Ideal for those who likes their crepe in crunchy form, but we prefer to have in soft version with more eggy fragrance. 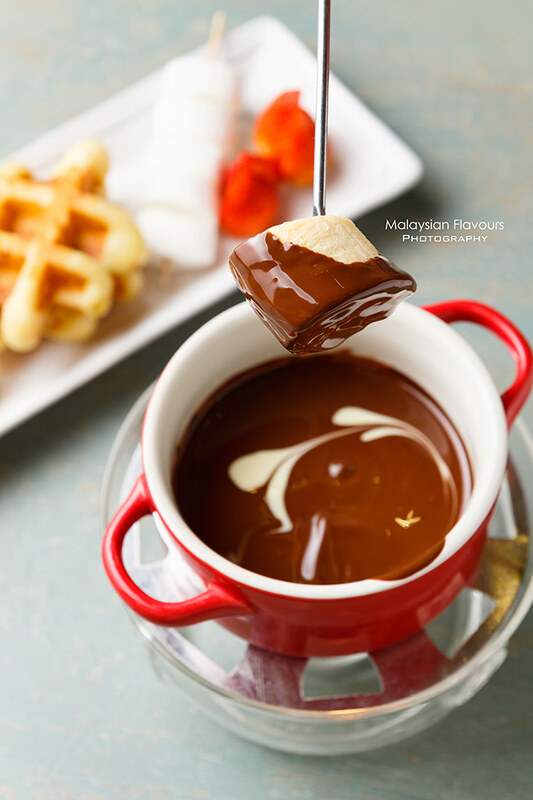 Continue to load your stomach with more chocolate by ordering Chocolate Fondue. We loved them in mini size, avoiding unwanted wastage. 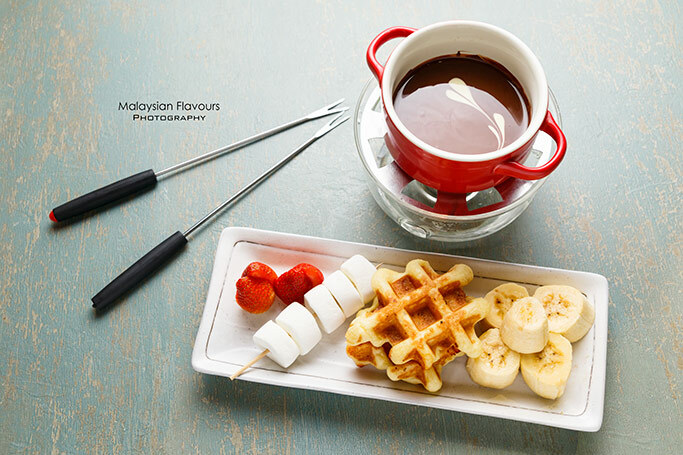 Simple combination of sliced banana, waffle, strawberry, marshmallow, Beigian waffle bite make up the dipping ingredients, with a pot of melted chocolate that is kept warm using small candle. The chocolate looks just luke warm, but is actually scalding hot. Be careful before putting into your mouth. 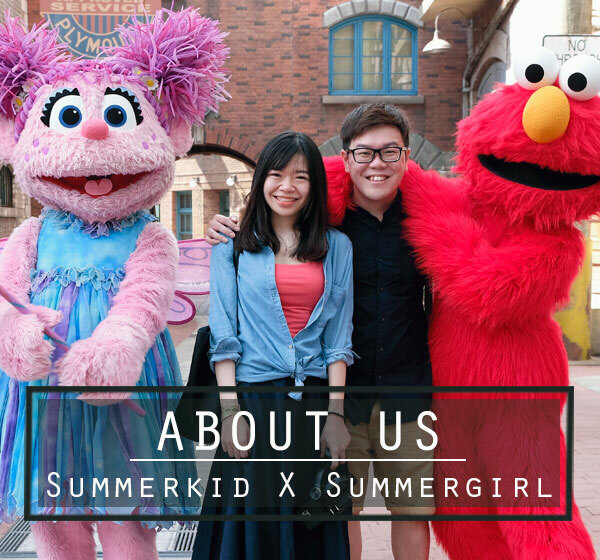 Summergirl got tongue burning first, followed by Summerkid. Two stupid fellars. 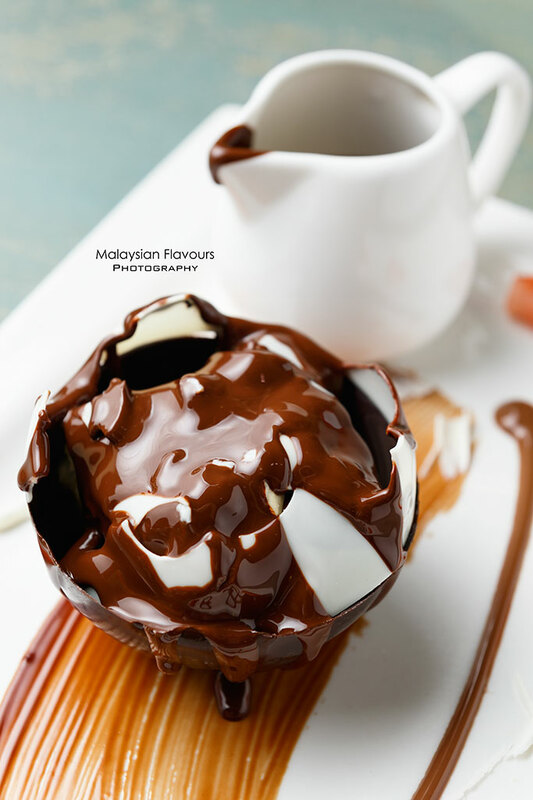 Popular all-time-favourite dessert that has warm, melted chocolate sauce nestled with moist chocolate cake. MAD About Coco adds a touch of crispiness by topping Ferrero Rocher ball on it. Served with vanilla ice cream. 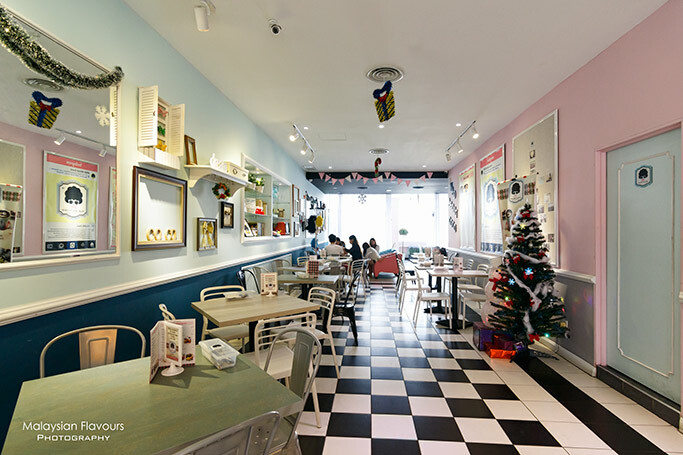 While The Owls Cafe focuses on fluffy yet compact waffles, Kulcafs Cafe calls for waffles plesantly enhanced with egg aroma, Belgium waffles in MAD About Coco Cafe on the other hand, is fresh and crispy at the outside, airy and light inside. 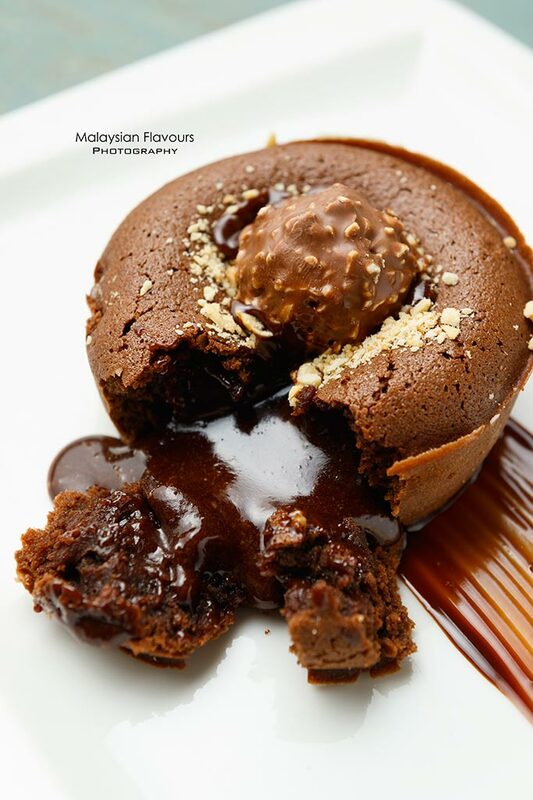 A right texture to reach for a balance with the thick chocolate sauce dressed over, resulting great combination that don’t make diners feel cloying. Served with chocolate ice cream, banana and strawberry. 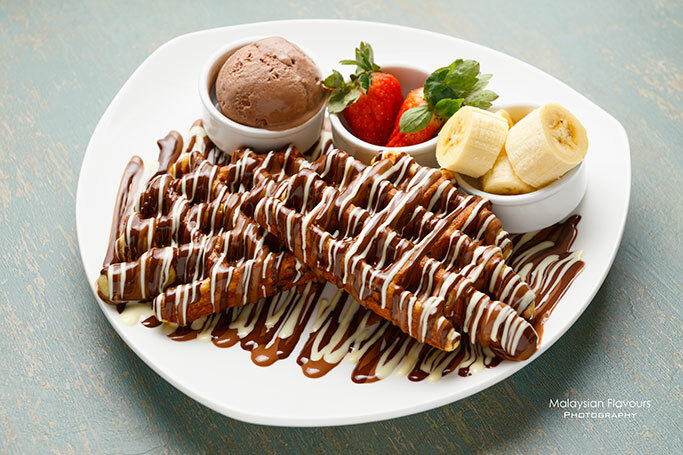 For diners who wish to keep their waffle simple, opt for Belgium Waffle (RM12/one, RM20/2) with Pure Melted Chocolate. 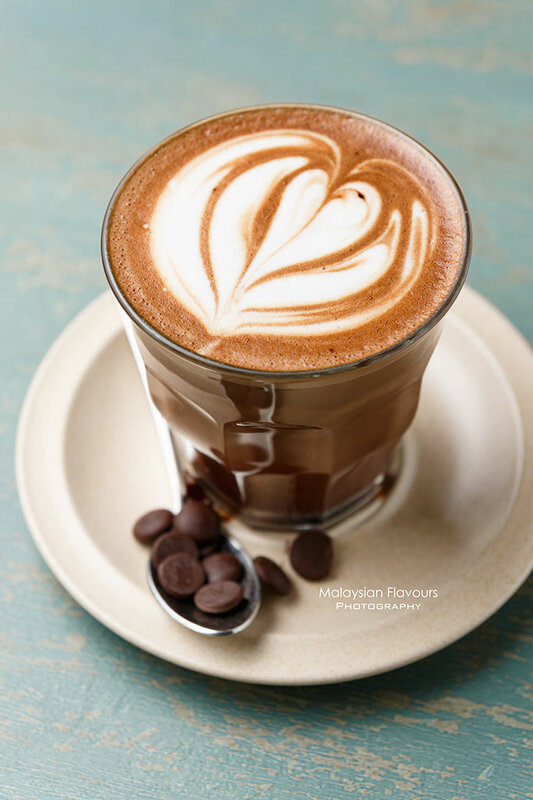 …Or premium Valrhona Hot Chocolate, Belgium chocolate infused mocha. 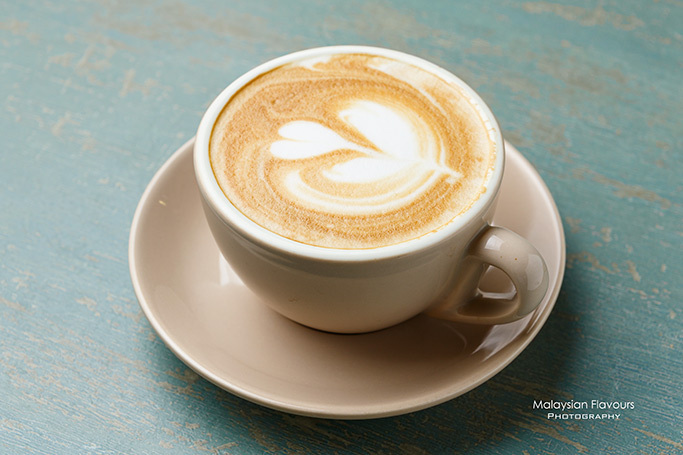 Espresso-based drink such as cappuccino, latte, flat white, long black are available too. Jasmine tea, Chamomile Dream tea, Lavender Earl Grey Tea Non-coffee, Breakfast Tea are ready for non-coffee patrons. In case you were in MAD About Coco with a hungry stomach and seek for savoury dishes before tucking into Coco’s Sweet Treats, you are welcome to order pastas, sandwiches, burger, breakfast in cup, or waffles chicken from the food menu. In short, MAD About Coco is a worth recommended cafe for decent desserts. May not be the best, but we like the friendly service, hard effort in presenting every dish to be photography-worthy while tasting delicious is much appreciated. Are you always mad about dessert? Visit MAD About Coco Cafe!